This oil massage treatment aims at having a positive impact on problems of Obesity, particularly for Diabetic Gangrene. The massage is carried out for 45 minutes every day and continues upto 14 days. This treatment is considered extremely helpful in curing diseases like Spondylosis, Rheumatism, Spinal Disorders, Osteoarthritis, Paralysis, Neurological Disorders, Disc Problems, Hemiplegia, Back Pain, Asthma and Arthritis. In this a herbal liquid is poured all over the body by means of a special vessel. The treatment continues for 14 days and takes around 45 minutes to 1 hour. The treatment is meant to cure problems like Insomnia, Vatha predominated diseases, Mental tension and certain Skin diseases. The treatment includes pouring of some herbal oil, medicated milk, medicated butter milk on the forehead in a special method for around 45 minutes. The treatment is carried out for a duration that ranges between 7 to 21 days. In this, a specially prepared warm medicated oil is placed over the body parts and is bordered with herbal paste. The treatment continues for 45 - 60 minutes. It is useful for problems like Spondylosis, Arthritis, Back Pain and Disc Problem. Kizhi provides relief from osteoarthritis, arthritis with swelling, spondilosis, sports injuries etc. The treatment basically includes application of herbal leaves and powders (that are made into pouches and immersed in warm medicated oil) all over the body for 45 - 60 minutes per day. The process continues for 14 days. This milk steam treatment combines herbal medicinal decoction and milk which together is heated. The steam emanating from this is passed over the affected part. The treatment is particularly utilized to cure problems like Numbness, Paralysis, Neurological Disorders, Headaches, Facial Palsy and Allergic Rhinitis. The treatment is used to cure inflammatory problems. In this medicated herbal paste is applied on the affected portion of the body. This cures Paralysis, Neurological Disorders, Migraine, Mental Tension, Headaches, Hair Greying - Premature, Hair And Scalp., Facial Palsy, ENT Problems, Allergic Rhinitis and Skin Diseases (some Types). The treatment includes application of herbal juices and medicated oil through nose for a period of 1 to 7 days. The treatment include the massage of the whole body or a specific part of the body which results in that part perspiring. The massage is done by two masseurs for a period of about 60 to 90 minutes per session. Disease which have been found to be positively affected by this treatment include Neurological Disorders, Muscular Diseases (Atrophy), Muscle Pain, Multiple Sclerosis, Limbs - Emaciation Of, Inflammatory Conditions, Hemiplegia, Disc Problems, Diabetic Neuropathy, Back Pain and Arthritis. The treatment continued for 7 - 21 days cures problems like Arthritis, Paralysis, Hemiplegia, Paralysis-Agitanus, Sexual Weakness, Nervous Weakness and Nervous disorders etc. In this lukeworm oil is applied all over the body in a rhythmic pattern by two to four trained therapists. This treatment is found to cure problems like Facial Paralysis, Dryness of nostrils, mouth and throat, Severe headaches, and other Vatha originated diseases. The treatment has a cap fitted on the patients' forehead in which lukewarm herbal oils are poured. The treatment takes time depending upon the condition of the patient. The word literally translates into oral intake of medicated oils or ghee preparations. The quantity of the intake is gradually increased during the course of treatment. The treatment is useful to cure Osteoathritis, Psoriasis, Leukaemia etc. Medicated oil is applied on the top of the head for 20 - 40 minutes that proves useful in curing diseases like Headaches, Hair Greying - Premature, Anxiety, Insomnia and Memory Loss. As in Kativasthi, warm medicated oil is placed over the chest for 45 minutes which proves beneficent in treating Ankylosing Spondylitis, Arthritis, Muscular Chest Pain, Rheumatism and Sports Injuries. This treatment entails application of herbal oils and decoctions through the vaginal route. It helps in curing gynecological disorders. 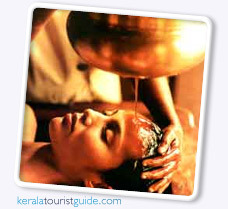 is a form of Ayurveda medicine that involves gently flowing liquids over the forehead. It was developed by vaidyas in Kerala, Shirodhara has been used to treat a variety of conditions including eye diseases, sinusitis, allergic rhinitis, greying of hair, loss of memory, neurological disorders, memory loss, insomnia, hearing impairment, tinnitus, vertigo, M�ni�re's disease and certain types of skin diseases like psoriasis. It is also used non-medicinally at spas for its relaxing properties.